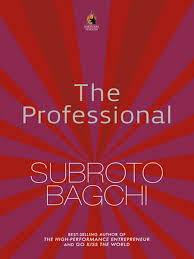 The Professional – Subroto Bagchi who is also Best Seller Author of the High Performance Entrepreneur and Go Kiss the World books. This book is a masterpiece for enlightening the attributes of a professional through personal anecdotes, illustrating both professional and unprofessional conduct. It is also about professional’s professionals to symbolise the true spirit in a professional capacity.